Sixty different enemies, 10 weapons, buckets of blood. You're welcome. Minigore 2: Zombies' beauty lay in its simplicity. Much like the beloved original, Mountain Sheep's newest effort never tries to be anything other than a twin-stick third person shooter, and it's a great one. 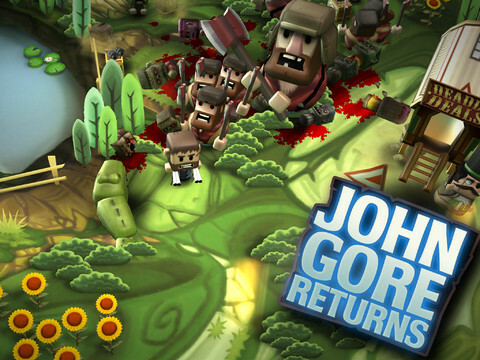 Once again, the grizzled John Gore reprises his role of all-around monster blasting badass, except in this case, he's up against not only the undead horde, but also crazed bunny rabbits, cracked out lumberjacks and even the Grim Reaper. Fortunately, he and his buddies have enough artillery to get the job done. One of the coolest features is the game's ability to display up to 150 characters at once, which it does effortlessly. 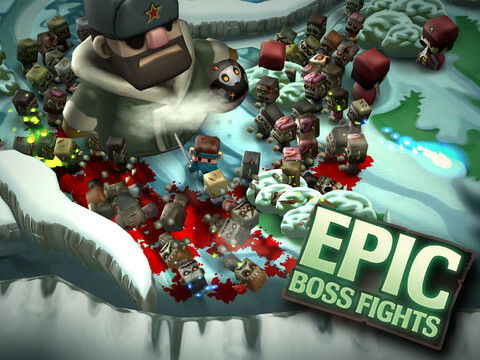 Play for just several minutes, and it won't take long before a whole mess of baddies clog the screen. Eventually, it becomes so overwhelming that you have no choice but to go down firing. Not that death should be on your mind, especially with 10 different types of weapons littering the graveyard and other locations you'll do battle within. Swords, hammers, axes and chainsaws let you slaughter critters from a more intimate range, while machine guns, a grenade launcher and shotgun (all of which are upgradeable) help Mr. Gore cut through his adversaries, leaving behind piles of bloody carcasses. On top of that, collecting special items transforms the hero into a beast, giving you a chance (albeit for a limited time) to plow through the rotting masses. This works for all of the playable characters, a list that includes favorites from App Store games past, like Bike Baron, the redneck from Zombieville USA and the guy from Hook Champ. Meanwhile, the game's visuals impress, not just with the sheer number of bad guys fighting for screen real estate, but also the clean environments and character models. Throw authoritative sound effects into the mix, and you have an action packed presentation. One could make the argument that Minigore 2: Zombies has little complexity and not enough weapons, but considering the $1.99 asking price, we think it's full of head-chopping, limb-blasting goodness. Play it to waste time. Play it to beat your high score, or just play it to let off some steam. Just make sure, above all else, that you play it. What's Hot: Rekindles old school twin-stick shooting magic, 150 characters on screen, cameos by App Store favorites, 10 instruments of destruction. What's Not: Characters are a bit slow at first, not much depth.